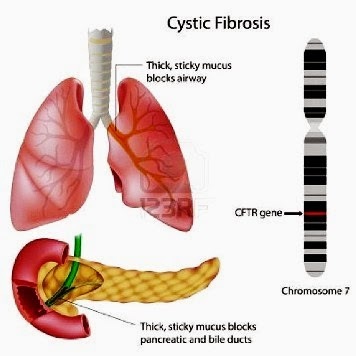 Cystic fibrosis (CF) is an inherited condition affecting the glands that produce body fluids or secretions. This hereditary disorder is characterized by lung congestion and infection plus malabsorption of nutrients by the pancreas. In CF, these secretions are stickier and thicker than normal. This hinders the functioning of important organs, such as the lungs and digestive system. The exact cause of CF is a single faulty gene found on chromosome 7, which controls salt and water movement in and out of cells within the body. To develop CF, a baby has to inherit the faulty gene from both parents. About one in 25 people in the UK is a carrier of the CF gene. Inheritance is autosomal recessive. This means if both parents are carriers there's a one in four chance their child will have CF and a two in four chance their child will be a carrier but won't have the disease. There's a one in four chance their child will neither have CF nor be a carrier. The life expectancy of CF patients continues to increase. About 75 per cent of affected children survive to young adulthood and the average life expectancy is between 30 and 40. As yet there's no cure for CF or any way of preventing it. However, since the faulty gene has been identified, much work and research is being done to try to find ways to either repair or replace this gene through gene therapy. All newborn babies are screened for cystic fibrosis. Antenatal tests for the disease are also available. Treatment can help people to live with cystic fibrosis. It can also prevent or reduce long-term damage from infection and other complications. High-energy foods, enzyme supplements, and vitamin and mineral supplements help a person with CF to get the nutrients they need. Regular exercise is important to keep the body fit and healthy. Daily physiotherapy and breathing exercises help to keep the body healthy and to prevent excessive build up of mucus in the lungs. Antibiotics and other medicines are used to control lung infections and inflammation. If respiratory failure occurs, a lung transplant may be necessary.